For about a month now, I have been where Renee' Altson once described as "between death and resurrection." Not wanting to make any changes, not wanting to move forward, but not wanting to stay where I've been, either. The photo above, which I found for some other topic entirely, is a picture of just where I am these days. 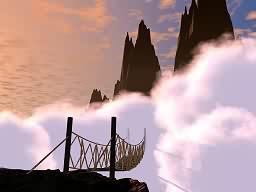 I can see that there is a place to go - but I can't see where, and I can't be sure that the other end of the bridge isn't a sheer drop (or even if the bridge itself will hold). At certain times, I would give up important (if not-often-used) body parts to be free of this malaise. There have been a couple times when despair has just washed over me, and I've been ready to just throw in the towel. There have been days when I just can't see any way out of the mess in which my family and I find ourselves....even, God help me, a couple days when the value of my life-insurance policy briefly seemed far in excess of my value in day-to-day life. Bijou Simon...who Laila Barr, Mike Willis and I helped nurse through Greek class. Ian Reid, who was in several classes with me. Preston Hoffman. Erik Allen. All already ordained. Lisa Parker, Ben Ingelson, Patrick Shebeck...so many others, all graduated and awaiting calls. I suppose it would help more if things in the here-and-now were going better. Yet even with my presence and contributing to my sister and brother-in-law's situation, we continue to skate on the thin edge of disaster. And on Friday (my twin sisters' birthday), it sure seemed like the ice had started to crack beneath us. Sue's car had been running badly for a while - and when we took the car over to the repair shop, they wanted almost $2,000 to fix it - a 2000 Ford Taurus with 80K miles on it. Somehow, there didn't seem much sanity in sinking $2k into a car that BlueBook.com says is worth between $2,800 and $4,000. On the surface, it just didn't seem like much sense. But by the same token, trying to get a car to replace it for $3k or $4k didn't seem like we'd get much of a better car than we had, to be honest. And either way, they'd have to tap into their 401k savings - which are meager to begin with. The picture was clear - "happy freakin' birthday," eh? Sue kind of had a mini-meltdown this afternoon, and once she got past that, I kind of had my own later on. Sue's really been one of the buttresses of this situation, and when I saw her crack, I have to admit that I kind of lost hope for a bit. I kept thinking of the "Blue Collar Comedy Tour" skit, where one of the comics was on a plane which lost one engine on their approach to the airport. The comic's seat-mate, in a panic, asked him, "So how far will one engine carry us??..." to which the comic replied, "...all the way to the crash scene..."
But it seems that almost every time I am in the car, the local K-LOVE Christian radio outlet has been playing the song by John Waller (whose chorus appears at the top of this post). And within minutes of hearing the song, I will invariably hear from my sister, or a sponsee, or any one of a variety of church and recovery friends from Kansas, Chicago, or Toledo. And the day just seems better after that. That doesn't mean that the situation isn't bleak, or that somehow some angel is going to buy us a lottery ticket and make it a winner in the same week (though that fantasy flits through my brain a lot, at times). It just means that grace sufficient for the day's troubles is delivered, when and how I need it (even if it's not how I want it). Of course, part of the daily surrender in this deal means that we may yet end up car-less, or on the street, or in some apartment somewhere. We may yet become one of the thousands of foreclosures sweeping across Ohio (and the nation) and need to walk away from this home and this life. But for today, God has set before me life or death, blessing or cursing. And today, at least, I "will choose to be a blessing for life." My life, and my family, are valued more than just by our possessions or our address or whatever. All I have to do is read the comments on so many of these postings to know that. When I hear the voices of people whose lives are enriched by my presence, my words, my writings, I know that the old UCC ads are right, and "God is still speaking..." Still speaking, and still using broken people and broken tools to build the Kingdom. I would love to tell you that I've been gone from these spaces for 15 days because I've been on a spiritual retreat. That would be a good reason, I suppose. The real reason would be closer to being a spirit in retreat. It would also have more than a little to do with having trouble sitting up. Literally. I went for a week, starting Sunday the 8th, with unbelievable pain in my lower back, such that it was nearly impossible to sit for any period of time. I mean, not at the desk, not at the PC, not watching TV, or driving. It was pretty damn tough sitting down in the lavatory, let alone standing. It just wasn't any fun at all. But Tim's "where are you?" comment made me realize that no matter what, it was time to at least send up a flare. So I am here, "just as I am," so to speak. In amongst all this, there is good news. Sister Sue seems to be doing reasonably well, for a while - my being down has corresponded to her being OK, for a bit. That is always good news. My dear friend Norma - whose friendship I have treasured since we began trudging the seminarian's road together at St. Paul School of Theology back in 1997 - has found love and friendship with a gentleman from the town where she is ministering. He has proposed; she has accepted. And (having no living parents or elder relatives) she has asked me to give her away for her September 15th wedding. I am delighted for her, and am trying to save my sheckels for the 765-mile drive into the Heart of America. There seems to be a renewed burst of interest among some of the inactive members of my DeMolay chapter. The young men are having an overnight gathering at the Temple Friday night, and I am praying for inspiration to share with them. I have so far managed to avoid any spoilers about the ending of the soon-to-arrive Harry Potter and The Deathly Hallows. Amazon will be delivering my copy via next-day delivery on Saturday (so I can avoid the insanity of lines at the stores). Not sure how much reading I will get done after being up all night with the kids, but we shall persevere...of all the tasks I have ahead of me, that will be one worth working through! And, just as gentle frosting on the cake, a few dribs and drabs of rain have pushed the local sweet corn crop near to fruition. And when there is fresh sweet corn and fresh strawberries in northwest Ohio, life gets pretty damn good. Rules. Who's "in" and who's "out." Who's going to hell and/or heaven. Have you said "the sinner's prayer" - just right? Are you holding your hands just so, in order to bless the communion elements (because the epiklesis, the pouring down of the Holy Spirit on the elements, just won't happen if all the parts aren't arranged just so. The Spirit of God is rather particular about how the Table is set before He/She/It appears, you know....). All the rules and conditions and exceptions and moronicity of organized religion reminds me very much of a blind man, searching in a dark room for a black cat that isn't there. I've been listening to variants on this nonsense since I was old enough to understand English, and it makes less and less sense with each passing day. Then there was a section in Sara Miles' wonderful book, Take This Bread: A Radical Conversion, where she is praying with people who are coming to their church's food pantry. A church Pharisee sees her laying hands on one of the customers, and starts into a rave about whether the pastors have duly authorized Sara to pray or anoint "these people," and whether the bishop should be involved, and what does she think she's doing? That kind of nonsense makes me crazy. The doctrine of apostolic succession is the belief that the 12 apostles passed on their authority to successors, who then passed the apostolic authority on to their successors, continuing throughout the centuries, even unto today. The Roman Catholic Church sees Peter as the leader of the apostles, with the greatest authority, and therefore his successors carry on the greatest authority. Other churches who want to get in on this "line of succession" try to see where their branch of Christendom (not Christianity - there is a difference) split off from "the main line," and claim authority based on this "line of succession." Now, anyone who has studied church history for more than, oh, a week and who has not had a frontal lobotomy can see that this whole idea is more shot-full-of-holes than a block of Gruyere swiss. At a couple different points in the church history timeline, there were multiple Popes and/or anti-Popes, in different cities, fighting to the death to remain Pope. So, any pretense that the "line" remained intact during the various sunderings of the Papacy would have easily shattered in those places (and there were several). It doesn't take a great mind to see that there is a big, big difference between spiritual authority and temporal, political authority. Thanks to Emperor Constantine and his conversion in 312 AD, however, the Church and State became one in his person, and people who are in power rarely choose to relinquish it. So there was a large justification for retaining the temporal authority of the Popes, and it worked that way for a long time. The online Catholic Encyclopedia points out that "In the third century the popes claim authority from the fact that they are St. Peter's successors, and no one objects to this claim, no one raises a counter-claim." This is perhaps the weakest logical support for any statement - "I've made a statement, and no one has objected to it; hence, it is true." It completely ignores the fact that in the third century, there was little opportunity for resistance by anyone who would object, and that afterwards, the Church had the support of the State (including their military) which tended to suppress debate a bit. Now, please, please understand this - this is not another anti-Catholic polemic. I am so past that, boys'n'girls. Just because the Catholic curia says stupid things, that is not any reason to discount the faith (and good works) of millions of observant Catholics. I hang around with a good number of Catholics these days, and I honor their faith in Christ and their service to the world. When they bring up doctrines like apostolic succession, my eyes glaze over, and I simply agree to disagree with them. Though The Church doesn't see it this way, I see it as adiaphora - it may well be important to some, but this concept is not central to my Christian identity. We Episcopal folk agree that you Lutherans can be part of the "cool kids." You Lutherans can't have a valid and legal ordination to the priesthood unless one of our Episcopal bishops lay hands on him/her, so they are included in this "unbroken chain of apostlery." None of the other kids, who still won't agree to this, get to be in our club. Like I said, it makes me crazy. This ain't what Jesus was talkin' about when he said, "Feed my lambs," folks. I guess what this boils down to are issues of rights, authority and power. Do I, as a non-ordained lay person, have the right or authority to pray with people, let alone anoint them with oil? Do I have the right or authority to speak the Words of Institution - or are those words only legitimate of they are spoken by someone who's had good Catholic or Episcopal hands laid on them in ordination? I keep coming back to Communion - Eucharist - because it's what I have most experience with. As a seminarian, I was leading worship on a Saturday night at Faith Lutheran in Prairie Village, KS. I'd been hired on as a lay preacher while we were searching for a new pastor, and the interim pastor would show up to bless the Communion elements on the every-other-Saturday service. But here it was, time to start the service, and no Pastor. "What are we going to DO?" cried one of the church-ladies. Once, after I'd started seminary, one of my AA sponsees wanted me to marry him to his fiancee'. Neither one had use for a church; neither one believed in Christ - but both of them were absolutely sure that God had let the two of them together, and wanted someone who knew their story, and knew their understanding of God, to bless their union. I told them I had no legal ability to marry them - but if they went to the Justice of the Peace on Friday afternoon, I would be able to craft for them a celebration of their marriage which would incorporate every aspect of their life. And it was great. I believe with all my heart that God was no less present, and God blessed those two no less, than if it had happened in a church by a pastor with all the requisite pomp and circumstance. For my own mind, there is no action by another human being that is going to determine my suitability as a member of the body of Christ. As I wrote about a few days ago, I am not interested in rituals of flame-proofing; I have already been to Hell, and choose not to go back over the rules of men (none of THESE were ever agreed on by women!). I happen to believe that Roman 8:38-39 happens to be true - that no one gets to stand between me and the love of God. I have no quarrel with ordination; I believe it fulfills a necessary requirement in the orderly way of the world for churches. Just don't tell me that an ordained priest or minister is the only one who - spiritually (not legally) - can perform the rites of priesthood. Because it just ain't so. I don't need to be a trained minister or pastoral counselor to pray with those who are hurting. My Ritz-n-Dr.-Pepper Eucharist will not condemn anyone to burn. And it doesn't matter who's laid hands on who - because the authority and the Spirit comes from God, not from the hands of man. I've seen many instances where the man was duly consecrated and anointed - yet destroyed a congregation. And I've seen many instances where the person who I'd have bet was closest to God was the person least-qualified in the eyes of the world to speak for the Almighty. Even looking back on what I've written, I know that folks can and will argue about differing standards of what is holy or sacred or whatever, and how certain practices make things "right" for them. And they, of course, are welcome to it. For me, my "holiness" or "sacredness" has nothing to do with what I've done - because my "garments of white" were rather soiled from my prior and current life. It is only "Jesus' love and righteousness" that gives me a hope of escaping hell. Nothing I do is gonna influence that one iota. So my friends can argue about this or that theological tidbit, concept or nuance. I'm gonna leave 'em to it, and try to go be about my Master's business. In the last few years I've been surprised at the number of mature, faith-filled Christ followers I've met who have stopped going to church altogether. All of them are simply unable to buy into the insanity of the church culture anymore. Those lines hit home - because I'm afraid I'm becoming one of them. Over the last several months, I have been struggling to attend a nearby Lutheran church. I mean, really, really struggling. I can find just about any excuse to not go to church - just about anything makes it OK to skip Sunday worship. Now, I have to confess: if I should be having this feeling, it shouldn't be with this church. Because this isn't your everyday Lutheran church; this is not a congregation of "the frozen chosen." They have a mission; they have a mission statement; they have contemporary worship. They have been through a building program that transformed their "shotgun" sanctuary into a more welcoming "fan-style" worship center. The pews are gone, the movable seating is in. They have an outreach congregation specifically focused on people who don't want to go to church. It is, in short, everything that I was desperately searching for when I found Atonement; in fact, it is everything I wished Atonement was when I got to Atonement! On the surface, it's everything that I hoped a congregation that I pastored could have been. And it leaves me cold. You see, I need this "community" you talked about in your newsletter to the congregation. I need people to draw me in, to involve me, to welcome me. I need someplace where they know my name. Someplace where I am needed and wanted and able to make a difference. Some place where it would matter if I'm sick; where it would matter if I'm well. Someplace that would miss me if I died. This place has that, seemingly. They have the energy; there are things happening there. But somehow, I don't feel the invitation. In the summer of 2000, when I (and the other members of the Faith Lutheran diaspora) landed on the shores at 99th and Metcalf, it might have been that things were broken and needy enough at Atonement Lutheran that we felt needed. There were things to do - places to fill, songs to sing, children's sermons to do, a class to teach, Alpha to start, etc...and there were places where a hand was needed. Maybe I don't perceive the need, here. Maybe what I'm feeling is that the expectation at this place is to sit down, do the worship drill, hand in the check, have some coffee, and leave. And maybe I want, or need, something more than that. I actually wondered if I'd just forgotten how to be "just a member"? Had I, by virtue of being on worship teams and vision boards and leadership and church councils - not to mention two years at seminary - become so codependent that I only know how to be a part of an organization if it's in crisis? Had I somehow caught a bad case of Dudley Do-Right Syndrome - always starting off my membership with "I'll save you, Nell!" ? I don't think that's it. Otherwise, I would have done that very same thing with my AA membership. I would have instantly leapt into saving all the newbies when the came in, and getting into the service organization (intergroup committees and the like). At AA meetings around the city, I feel welcome, I feel engaged and "a part of," so somehow it's different at church. I also asked myself the other obvious question - am I feeling uncomfortable about going into a church now that I'm "out"? - but I really don't think it has anything to do with it. I don't get a homophobic vibe from this place. I don't feel the need to don a rainbow-flag patch and start demonstrating a' la "Queer Nation," shouting We're here, we're queer, get used to it! I believe I'm quite capable of confronting the church if the fact that I'm gay gets out - I understand my faith enough to do that. But I'm not going into this place as "a gay Christian." I'm just Steve, looking for a place to land. So I just don't find that it's an issue here. I do know this: I'd really, really, really encourage you to pick up a copy of Take This Bread, by Sara Miles, and read it cover to cover. It takes a bit for her to get going - but every word is setting her up for an amazing conversion of an admitted church outsider. You will find a story of an admittedly fringe liberal church who encounters someone who learned missional out in the world - who then heard the message of the communion table, and thought (somehow) that God really meant what he said. There are a whole bunch of folks who are hearing, in Sara Miles' expereince at St. Gregory's, the call of what they want to see the church look like. I know I am. You're in my thoughts and prayers for a powerful, transforming time away, brother. May it be everything you've prayed for!